Heating the Greenhouse using passive solar methods? 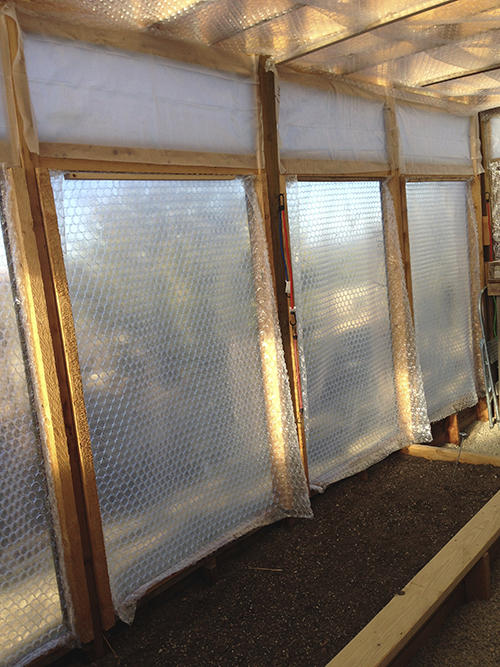 I want to heat the greenhouse in the winter using passive solar methods. There is nothing growing in it so far this winter but I’m doing some experimenting to see how warm I can get it (my goal is around 32°F or warmer) at night. To this end I’m experimenting using compost to help heat it, putting some barrels with water in them to act as a heat sinks and I’m insulating the structure inside a little better so as not to lose so much heat at night. If the sun shines, it gets between 70-80° in the day right now (which is delightful) and I’d like to keep some of that heat in at night and not lose it. Of course I had the opposite problem last summer when it got too hot but that’s another problem I’ll address this summer! The compost pile is only 1/2 a yard so is probably not enough to keep it significantly warmer inside the greenhouse but what if it adds a degree or two? I’ll take it. Everything helps. 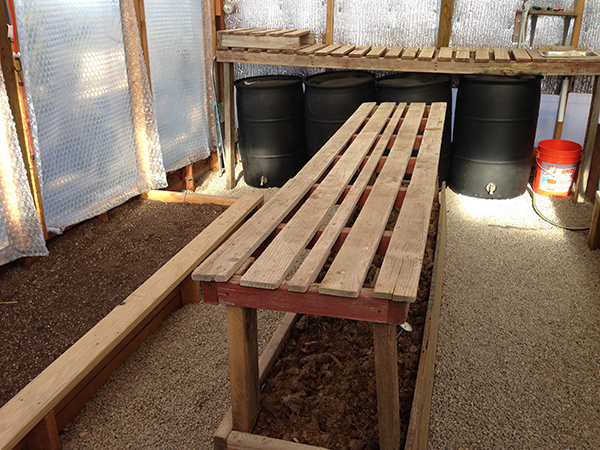 The compost pile got up to 112°F while the surrounding soil in the two raised beds is 40°F. Not that I’m planting in the compost but it shows it is significantly warmer. Now it has cooled down to 60°. The night temperatures are still below freezing inside. Since I didn’t have a chance make shutters for the screen windows before winter set in, my friend, Jody, thought of putting plastic on both sides of the open screen ‘windows’ to trap warm air and slow the heat loss. I’ve done that now. I just put bubble wrap on the windows to hopefully act as insulation to slow the loss of heat at night as well. Plus I added bubble wrap on the ceiling between the rafters. Elodie said probably a lot of heat is loss up there through the uninsulated fiberglass roof. Now the green house looks like a bubble wrap house on the inside! The night temperatures are still below freezing inside. I also have 4 rain barrels that I painted black and filled with water and installed hose bibs on the bottom so I can empty the water out at the end of winter. I put them under the growing tables and the night temperatures are still below freezing inside. And lastly I plugged up a lot of leaks where the roof meets the rafters. Did it work? Are my nighttime temperatures above freezing? NOPE. I’ve only been able to keep it about 5 degrees warmer than the outside temperature which make me go to plan B. This entry was posted in general, GREENHOUSE, WINTER GARDENING and tagged building a greenhouse, greenhouse, passive solar heat for a greenhouse, vegetable gardening, winter gardening. ← HAPPY NEW YEAR! This year slow down! Howdy Jeannine, We had good luck in the hoop house with water in cans right up against the side of the hoop house that got the most sun. It warmed up the water which then let its heat out over night. It looked like in your pictures that the barrels get no sun. Is the bubble wrap reflective? I really liked your compost idea, think it is a good one for continuos heat. When that pic was taken in early morning, the sun wasn’t on them yet. But still they don’t get a lot of sun-I’m not exactly sure how much sun. I’m going to see how many hrs a day they are getting. How big were these cans you used in the hoophouse? You are dealing with a differential outside ambient temp, been there done that and without a backup heating source and the 27/28 deg.F temperature shows up unexpectedly and you loose a bunch of plants then what? You can expect to maintain + 2 to 5 deg above ambient with the water barrels and if you drain them expecting a freeze then you defeated the purpose. I won’t drain the water from the barrels until summertime when it is hot. I am getting about a 5 degree difference warmer than the outside temp right now. Any other suggestions? 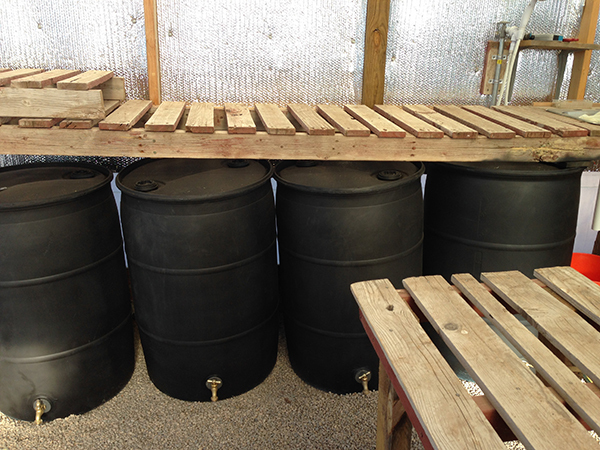 Your rain barrels are the right color, but are they facing southward so the sun can hit them throughout the day? That’s how the water tank in my growing dome is faced and it almost always stays above freezing. The bubble wrap is a good idea because it adds insulation and layers. Someone is manufacturing a poly tunnel plastic similar to bubble wrap so you are on the right track. well, you could get some chickens 🙂 My 24 hens managed to keep my coop above freezing every night of 20 to 30 below. The would have to be contained, of course, because your space is beautiful. if you have fresh manure, it would heat your compost more, maybe? Bricks also hold heat, and straw is a great insulator around the outside of buildings. You need a heat source, though, to raise the temperature, I think. I’ve seen greenhouses with the southwestern patio chimneys (I don’t know what they’re called), you make the fire in them at night and the clay pot of it stays warm and radiates heat. I would have to have an ‘out,’ of course. I haven’t tried the bubblewrap technique but I tried the water barrels and it didn’t work. Even when they were in the sun all day. I’ve heard good things about the bubblewrap though if it’s done correctly!